JsonTestCaseScriptRunner provisioned by SMW is a base class allowing to use a JSON format to create test definitions with the objective to compose "real" content and test integration with MediaWiki, Semantic MediaWiki, and Scribunto. The focus is on describing test definitions with its content and specify assertions to control the expected base line. 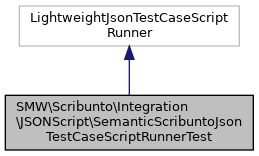 JsonTestCaseScriptRunner will handle the tearDown process and ensures that no test data are leaked into a production system but requires an active DB connection. Returns a list of files, an empty list is a sign to run all registered tests.